Glamorous fixtures and custom details abound in this space, making it a kitchen that radiates elegance. The simple cabinets blend well with the luxurious countertops and glossy backsplash to create a room that captivates without overwhelming. 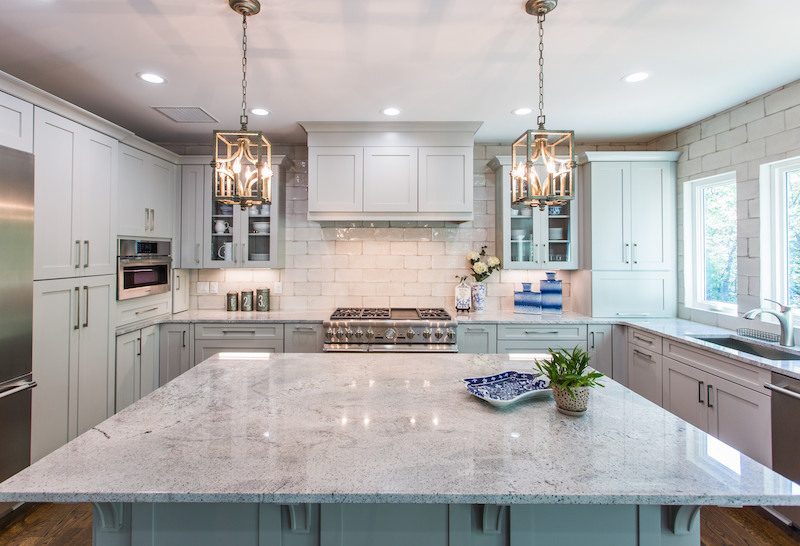 With a custom built-in pantry, glass door displays, and its calming Greystone finish, this kitchen blends elegance with plenty of discreet storage options. 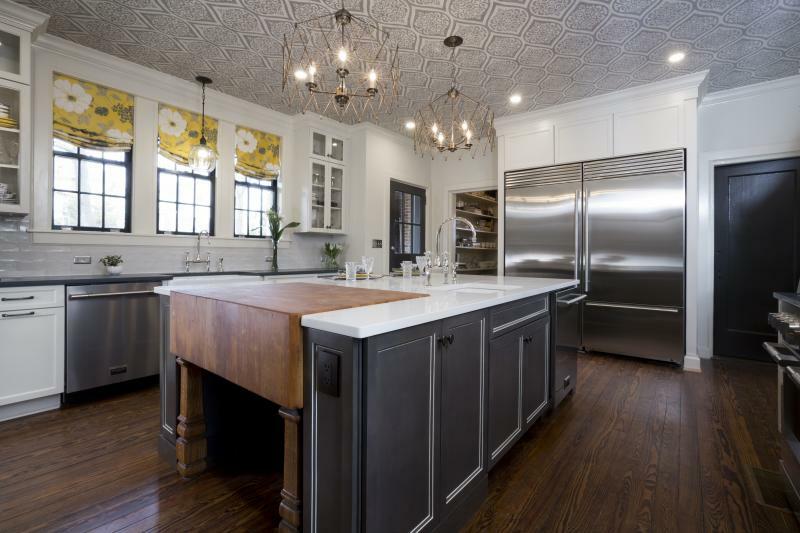 Remodeling the kitchen in a historic home previously featured on AETV’s Hoarders was no easy task for the Fuko-Rizzo family. 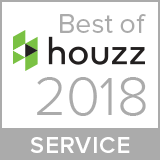 Fortunately, Marsh Kitchen & Bath designers understood the family’s vision for keeping the integrity of this 1929 home while carrying the space into the 21st century. The Fuko-Rizzos needed a kitchen that would work for their young family, but also a kitchen as grand as the rest of this historic home. 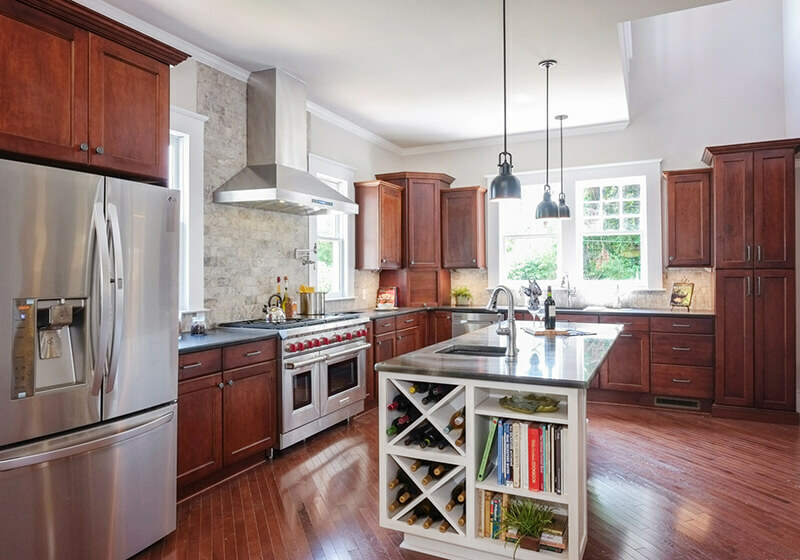 To achieve this timeless style, a classic Alpine finish on the perimeter contrasts the island’s trendy Graphite stain and Alabaster glaze while beautifully complementing the butcher block that has seen the home evolve over the past 90 years!